This project saw an existing heritage listed home doubled in size, with half the house paying homage to the interwar period style, and the other half with a complete contemporary makeover. Architect, Luke Van Jour, designed a two storey extension at the rear of the existing dwelling, comprising of additional bathrooms, bedrooms and living spaces. In order to comply with the heritage laws, the ultra modern design was cleverly integrated behind the existing roof line so that it remains hidden from the street. Cantilevered second storey supported by oversized structural posts and beams. The project began with the demolition of the existing maze of pokey rear living rooms, making way for the huge new suspended slab forming the floor of the downstairs living and outdoor areas. Oversized structural posts and beams were then craned into place creating the supporting structure carrying the seemingly floating upstairs bedrooms and bathrooms. This structure comprised of a number of large scale steel beams, with one single beam weighing in at a whopping 1.5 tonne used to support the 3m cantilever of the master bedroom. The new areas feature a huge open plan layout, a cantilevered second storey, and a very contemporary yet elementary raw material palette of concrete, timber and steel. 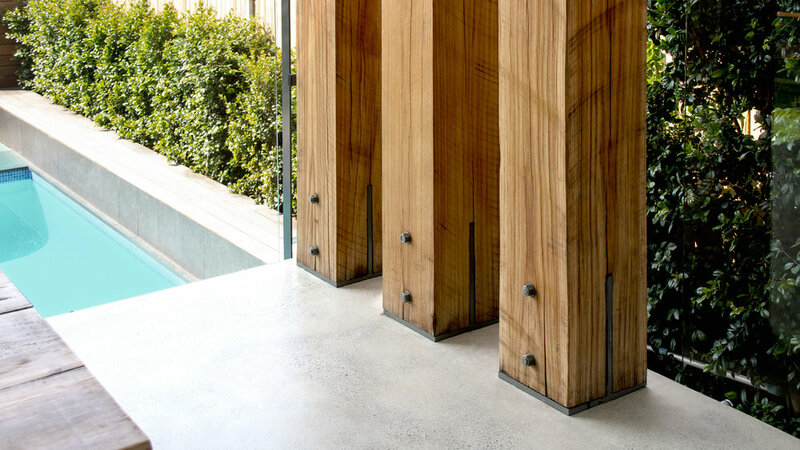 •A very contemporary yet elementary raw material palette of concrete, timber and steel.